Home > News & Blogs > Medical Negligence > Essure Device – The latest NHS Scandal? In September 2017, a contraceptive device, Essure, was removed from sale in the EU. It remains available in the US albeit more recently under strict restrictions. The manufacturer Bayer HealthCare pharmaceuticals commented that despite the device being deemed unsafe, its actions were justified on commercial grounds and deny that there is anything wrong with the device. Bayer released a statement at the time to say that no faults have been found with the device in 10 years of scientific research. 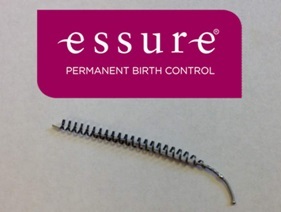 Essure is a device used as a permanent form of contraception. It is a small spring like device which is fitted onto the fallopian tubes effectively blocking the eggs from moving into the womb. The procedure is known as hysteroscopic sterilisation. The device was first marketed in the UK in 2009 but thousands of women across the world have complained of side effects in the years since. Unfortunately, there are no published figures available to confirm how many women have been fitted with the device. Hospitals in the UK were told last year to avoid using the device. Bayer claim that this is a voluntary request and it is up to each NHS Trust to decide what to do. This is likely to come as scant reassurance to female patients. Indeed, it has become apparent that many women have suffered life-changing injuries as a result of the device and many others have suffered significantly since having the device fitted. The Victoria Derbyshire programme exposed the problems with the device in a dedicated episode in 2017. Patients featuring on the programme revealed how the device had left them in crippling pain and some feeling suicidal. One woman suffered in agonising pain for three years before having to undergo a hysterectomy to remove the device. The device contains nickel and polyester and many women have experienced allergic reactions to the materials. Other complaints are that the device has perforated the fallopian tube and has either imbedded itself elsewhere in the body or cut through tissue resulting in nerve damage and significant pain. Removal of the device can be very complicated given the way in which the coils are attached to the fallopian tubes. This can result in further injury to the patient with most requiring the removal of fallopian tubes or the uterus completely. Whilst it is welcomed that use of the device has now been banned, it appears that this has come too late for some women. It is very concerning to learn that some NHS Trusts are continuing to use up old stock of the Essure device despite a ban from August last year. It begs the question why a Trust would risk injury to women given the known risks associated with its use. The news also strike a familiar chord with many medical negligence solicitors who have also represented women injured by controversial vaginal mesh implants and which has necessitated a governmental review. In the first instance, we would urge any women who are concerned about being injured as a result of this product to contact their Trust’s complaints department for answers. Beyond this, an injured patient may also want to seek legal advice on the issue. We are very concerned to see that woman have suffered from life-changing injuries including having to undergo hysterectomies and complicated surgery to repair damage caused by this product. Urgent investigations need to be undertaken as to what was known about the risks and complications of these devices when recommended to women. The emerging theme is that at the time women were advised that the device was an attractive contraceptive option due to it being very quick and non-invasive. One woman was told that once fitted she could go back to work after lunch time. Patients were also led to believe there would be no trauma or recovery period and, whilst it may be slightly uncomfortable, it would not be painful. Sadly for many, the reality has proven to be quite different. In this regard, it is vital that a patient is fully advised of the risks in order to provide their informed consent prior to any medical procedure. In the event that risks were known and not properly advised, patients may be entitled to compensation for their injuries via a medical negligence claim. If you have been fitted with an Essure device you may understandably be concerned about the treatment and advice you received. You may feel even more anxious if the procedure has not been successful and you are suffering from complications. If this is the case, you may have a claim for medical negligence and be entitled to compensation for your injuries. If you are worried, you should seek legal advice from a specialist about whether you have a claim. At Bolt Burdon Kemp, we have many years of experience of helping people with gynaecological injuries obtain compensation. We understand the devastating impact these injuries can have and will handle your claim sensitively and professionally. We will work closely with medical and legal experts to achieve the best result for you, as quickly as possible. We will also put you in touch with support services, who will be able to assist you during your claim and recovery. Hannah Travis is a senior solicitor at Bolt Burdon Kemp specialising in Medical Negligence claims. If you or a loved one are concerned about the treatment you have received, contact Hannah free of charge and in confidence on 0207 288 4820 or at hannahtravis@boltburdonkemp.co.uk. Alternatively, complete this form and one of the solicitors in the Medical Negligence team will contact you. Find out more about the Medical Negligence team.